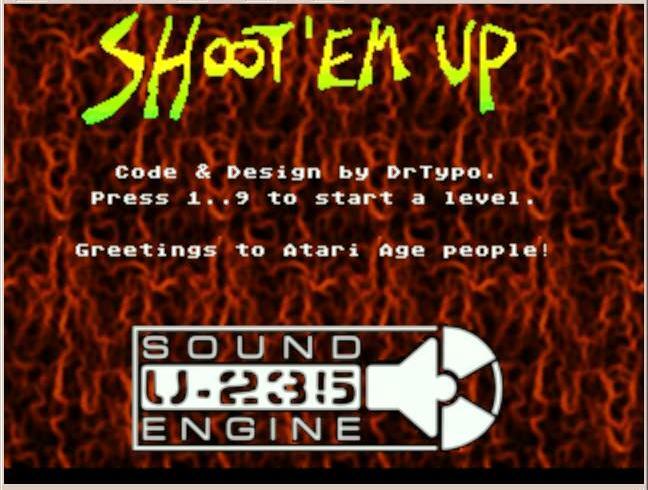 here is my first game for the Atari Jaguar: "Shoot'em up". It's a shoot them up kind of game. Yeah, I thought long and hard to find a name. 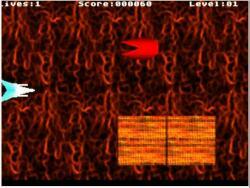 The game is provided with its manual in the zip file attached. I'll set up a proper website and provide the source code within a few days (hopefully). You can run it with the Skunkboard or with Virtual Jaguar. If you're using BJL let me know if you've trouble running it (it's provided as a .cof file). Nice one Typo, been looking forward to this since you mentioned it - grabbing it now! And you got the first game out to use the U-235SE, win! Made a BJL just incase someone does have trouble with the original file, 4000/4000. How do I restart after I die? I'm using VJ. 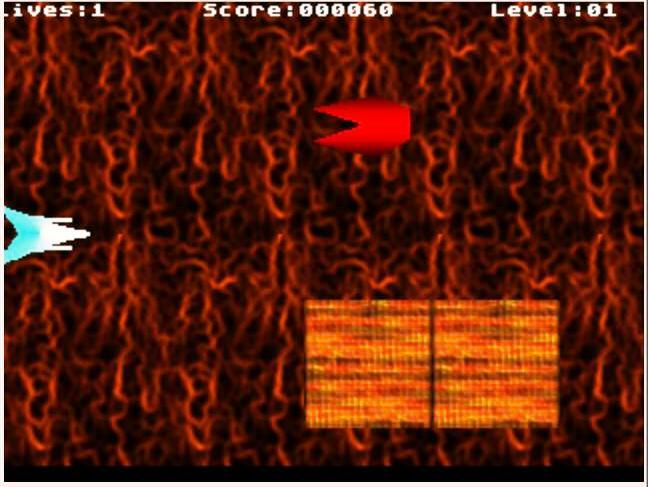 Fire 'B' to get back to menu, Keypad 1-9 for start level again. ok yeah got it. Some confusion using VJ for a bit. Notes on the game. I LOVE IT so far. I cant stop playing it. Had to yank myself away to answer this post. Dr. Typo good job! Thanks for sharing this. The U-235 sound engine seems like it works great. The sounds of the shots alternate right to left and sounds great. This is very cool. If you're going to keep going Typo you should consider a logo like U-235 has for its engine, which is very nice by the way. Good job! Looking forward to more! ok back to me playing! You should keep the name if you're going to keep working on this. Are you going to keep going on this? I gotta play this witha proper controller. I hope you don't mind. I am resposting this over at JSII. Cool. Will have to check it out. Excellent! I will be giving this a whirl when I get home from work tonight. 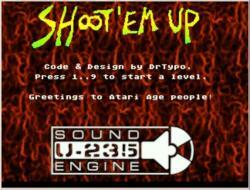 I don't plan to keep working on... "Shoot'em up". I would add a soundtracker module but for this I need LinkoVitch to implement more soundtracker commands in his engine. I left channels 1 to 4 free for this purpose. So get back to work LinkoVitch!!! Now I'm going to work on another project... yes, for the Jaguar. Oops, cross-post! When I said "get back to work" I was talking about the sound engine. Not the work that pays the bills and put food on your table. By the way I should also resume the work I'm paid to do and stop posting on Atari Age. Which effects do you need for your module? If they are amongst the simpler effects I can bump them up the implementation list. If you send me the module you plan to use I can use it as a reference module to ensure the features work when I am writing them (I won't leak the module out and will only use it for testing and dev). Glad it is working for you, working on hopefully improving its performance further before I get back into the module parser side of things. Awesome to see other developers for sure! Keep at it! Can we get a hint on what that is? I don't have a specific module for the game. I browsed the ModArchive a bit but haven't made up my mind yet. If a musician wants to do an original module for the game he's welcome to do it. Watch it play in a soundtracker! I have a few other references that I used to validate my own module player if you're interested. Well... it will be another small game. But I haven't written a single line of code yet. Even if it's relatively simple, it's going to take more time than "Shoot'em up". I have a ton of really nasty effect tastic modules to play with that use most of the effects. why don't people who develop for the Jag try for something great? I'm not being a hater , but (oops!) these homebrews are not exactly pushing the Jag hardware, not even a little bit. It takes too much time to develop something that pushes the hardware when you are working full time on that project. It takes a lot more time when you do it on your spare time. And at some point instead of a fun thing to do, it becomes another boring and stressful job.